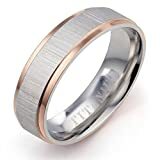 18K Rose Gold filled over durable material titanium, two tone colors, comfort fit design and light in weight which is very comfort to wear. Gemini’s Jewelry has been dedicated to creating elegant and long lasting jewelry for over 20 years. We always provide express service for our customers. We aim to give you professional service to ensure you are satisfied and we guarantee a 100% refund if you are not. At Gemini’s Jewelry, our customers are our priority. We specialize in using materials that are durable and affordable, bringing high quality jewelry to you at a price the average consumer can afford. If you are looking to purchase beautiful, high quality jewelry without breaking the bank, Gemini’s Jewelry is your new best friend.